Mothers and Children together - 6 year old Frida is the youngest participant. It is not only sports: The CSIT World Sports Games are a huge celebration for families as well. 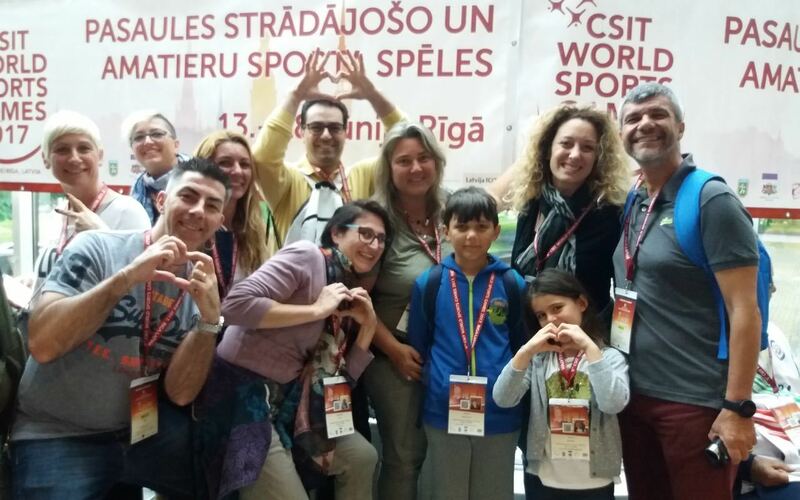 The Italians know this better than other athletes: 110 AICS team members and friends came to the WSG to Riga, including families with children. The youngest participant is Frida, 6 years of age, with her mother Lilly as her biggest supporter. Lilly is playing for one of the two Italian Mamanet teams. All the 14 players are Mamas. And lot of husbands will lead them. The AICS families have registered on Tuesday at the accreditation point and started their celebration right away. Wednesday morning they start into the Mamanet tournament. The AICS delegation is starting in all the sports disciplines, guided by Andre Patrignani: the strongest among the Italian teams is the swimming team with 23 athletes, most of them are "AICS champions" in Italy.